I’ll shout it from the rooftops and defend to anyone I meet that When Harry Met Sally is the best food movie of all time. Heck, I’ll amend that statement to say that it’s one of the top five best films of all time, full stop. The movie wouldn’t be what it is without the irreplaceable mind of Nora Ephron, whose wry but adoring observations of Manhattan life were as much a love letter to the city as they were to the heroines and heroes of each story. In addition to When Harry Met Sally, You’ve Got Mail and even Sleepless in Seattle share that sincere spirit. And as I walk around New York, my mind flickers like a film reel as I remember key moments from all these movies—the moment that “someone is staring at you in Personal Growth” or seeing a butterfly on the subway that’s likely on its way to Bloomingdale’s. I love to share the spots where these movies were filmed with visiting friends as we eat and drink our way around the city, but now I want to go one step further and share them with you. Use the embedded Google map below and follow along with a walking tour of Manhattan filming locations from all three films—with stops for food and drink along the route. Lace up your walking shoes and let’s go! 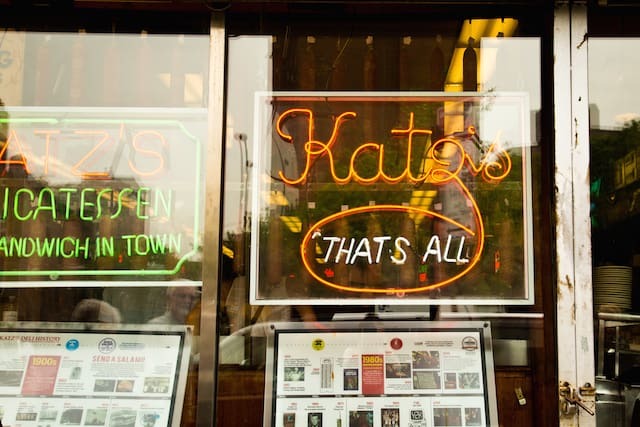 Start at Katz’s Delicatessen (205 E. Houston St. at Ludlow St.), home of what’s likely the most famous Nora Ephron scene of all time. You can totally have what she’s having, but if you’re starting this tour first thing in the morning, why not have a pastrami omelet alongside your bagels and lox? Walk west on Houston St. to the Puck Building (295 Lafayette St. at Broadway), which might be at the beginning of this walking tour but served as the filming location for the final scene in When Harry Met Sally—the New Year’s Eve party that Harry crashes to tell Sally that “when you realize you want to spend the rest of your life with somebody, you want the rest of your life to start as soon as possible.” Awwwww. (It was also where Jess and Marie had their wedding.) You can walk through the REI store that now occupies the former ballroom, but try not to pledge your undying love to a complete stranger. Head north to Washington Square Park (5th Ave. at Waverly Pl. ), where the first New York scene in When Harry Met Sally occurs: Sally dropping off Harry in front of the arch at the end of their post-grad road trip from Chicago. If they weren’t so grumpy with each other—”That’s too bad. 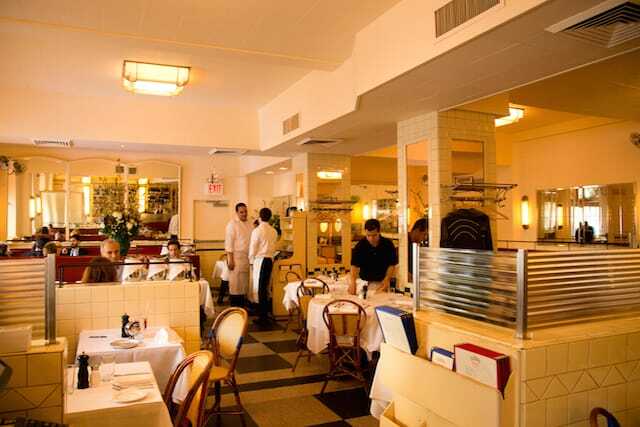 You were the only person I knew in New York”—they could have walked a block north to Otto (1 5th Ave. at 8th St.) to split a vongole pizza, though Sally would probably want her clams on the side. 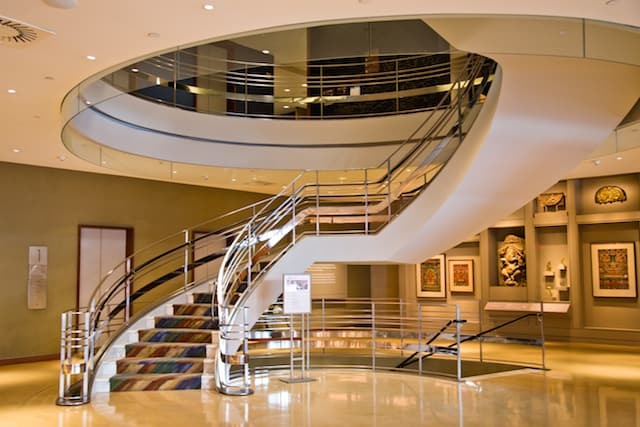 Next, a quick detour to Chelsea, where you’ll find the Rubin Museum of Art (150 W. 17th St. at 7th Ave.) Though it’s a fascinating collection of Himalayan art in its own right, you don’t need to pony up for museum admission to walk into the shop and Café Serai. Look closely. See the spiral staircase? You’re standing inside Fox & Sons Books from You’ve Got Mail. If only Chris Messina was waiting on the second floor to clumsily answer questions about Noel Streatfield’s Ballet Shoes book! Sleepless in Seattle doesn’t spend too much of its running time in New York City, but the Empire State Building (350 5th Ave. at 34th St.) plays enough of a role in the film that it could be considered a character in its own right. 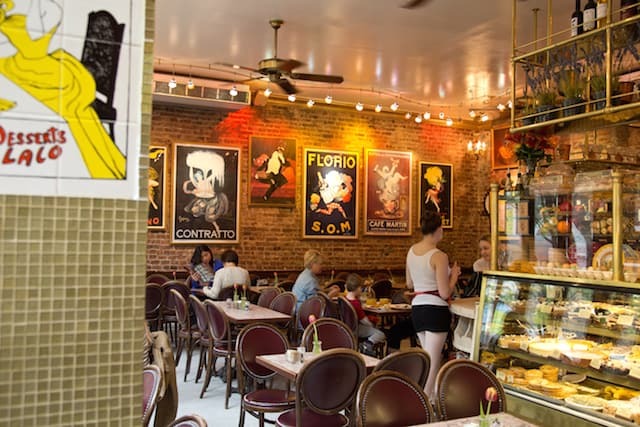 Take a quick (though pricey) trip up to the observation deck with your backpack and teddy bear, or just gaze at the building from across 33rd St. and pop inside Foley’s (18 W. 33rd St. between 5th and 6th Aves. ), New York’s finest baseball bar, for a drink. 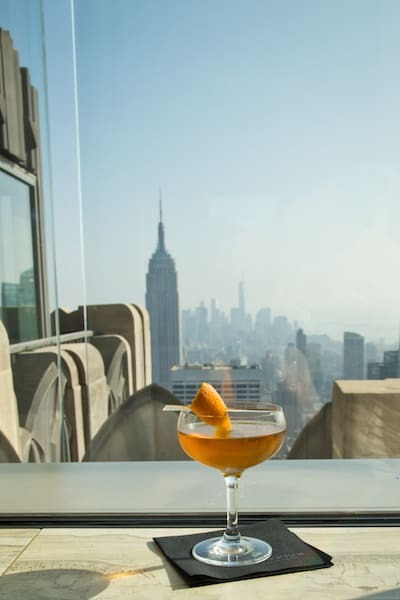 For another view—a sadder view, from jilted fiancé Walter’s standpoint—of the Empire State Building, blow a little bit of your budget on a drink at the Rainbow Room at Rockefeller Center (entrance on 49th St. between 5th and 6th Aves.). Continue up Fifth Avenue for a quick spin around the glittering glass cases at Tiffany & Co. (727 5th Ave. at 57th St.), where Annie and Walter shop for 10 place settings of registry china (eight is too few, 12 is too many), and glance over at The Plaza Hotel (768 5th Ave. between 58th and 59th Sts. ), where Annie pledges to stand by her man for their romantic Valentine’s Day weekend in the city. Then we can close the book on New York locations of Sleepless in Seattle. 20 blocks north of The Plaza, spend a few bucks on suggested admission for the Metropolitan Museum of Art (1000 5th Ave. at 82nd St.) and stroll around the Temple of Dendur on the museum’s first floor. Try—just try—not to do your best Harry Burns impression on passersby. 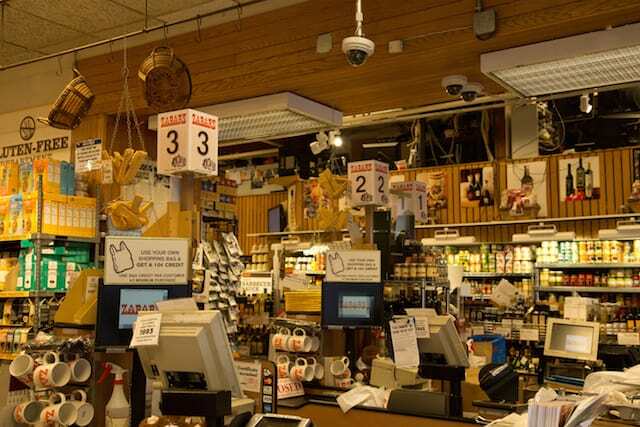 How many people walk through this space daily and mutter under their breath, “Waiter, there is too much pepper in my paprikash, but I would be proud to partake of your pecan pie”? Not nearly enough, I bet. You could spend all day getting distracted by the Met’s holdings, I know—but you gotta cruise out of there, because you have a hot date. 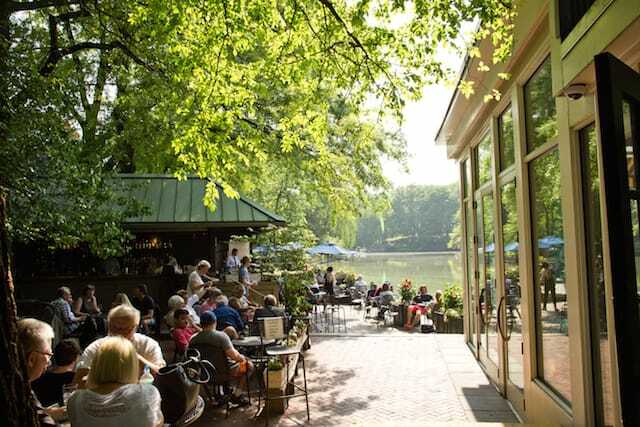 And bring your Rolodex of available men, because it’s time for a ladies’ lunch at the Central Park Boathouse (along the 72nd St. transverse). After Sally breaks up with Joe in When Harry Met Sally, she waits to tell her BFFs the news until they get together for a meal. 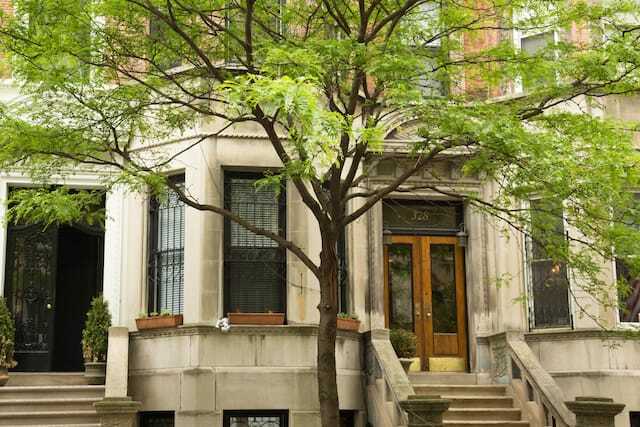 After lunch, walk west through the park to the corner of Columbus Ave. and W. 69th St. We’re finally on the Upper West Side, the setting for nearly all of You’ve Got Mail. The dry cleaner at 103 W. 69th St. might not look like anything special, but once upon a time it was home to Kathleen Kelly’s Shop Around the Corner. Life imitates art, and the cheese and antiques shop that called the space home for decades was pushed out by rising rents in 2008. Sorry, there’s no grilled radicchio on the menu at Café Luxembourg (200 W. 70th St. at Amsterdam Ave.), but you can still pretend to be double-dating with Harry, Sally, Jess, and Marie here while you debate whether “restaurants are to people in the Eighties what theater was to people in the Sixties” and that “pesto is the quiche of the Eighties.” Or you could just sink your teeth into one of the best BLTs in the ‘hood with a side of frites (don’t forget that Sally would once again want that lemon aioli on the side, though). 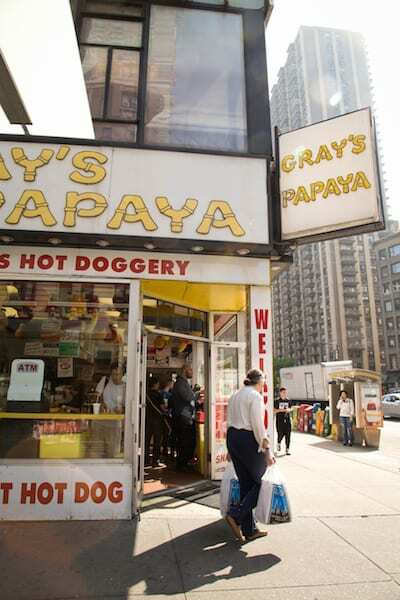 Or for a more classically New York experience, grab a couple of hot dogs from Gray’s Papaya (2090 Broadway at 72nd St.), easily visible with its sweeping signage across from Verdi Square and the imposing 72nd St. subway entrance. As Joe Fox surreptitiously woos Kathleen Kelly (done, as only the movies can, in montage form), they share hot dogs here. Work off those hot dogs with a walk around the perimeter of the American Museum of Natural History (77th St., between Columbus Ave. and Central Park West), where Harry and Sally finally decide that the statute of limitations on apologies is 10 years—”ooh, I can just get it in under the wire”—and take the first steps to becoming real friends. Even better if you’re taking the walk in the autumn to get the full cinematic effect of fallen leaves on the brick sidewalk! If you’re not too stuffed, you can stop by Shake Shack at the corner of Columbus and 77th to check out the shake of the week. ‘m still a little peeved that this encounter gave Joe Fox the upper hand in his relationship with Kathleen Kelly, but all’s well that ends well, so let’s move on. With a pastry in hand, if you prefer. All these food stops and no one’s invited you in for a game of Win, Lose, or Draw and one of Aunt Emily’s chocolate mousse pies? 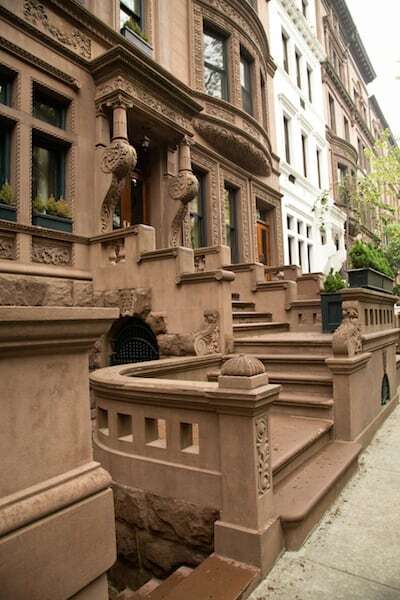 Bone up on your sketches of Baby Fish Mouth and knock on the door at Jess and Marie’s apartment from When Harry Met Sally at 32 W. 89th St. (between Columbus Ave. and Central Park West). Kathleen Kelly’s apartment at 328 W. 89th St. (between West End Ave. and Riverside Dr.). Bring a bunch of daisies—the friendliest flower—or for real bonus points, how about a bouquet of newly sharpened pencils? Finally, we’re ready to end this walking tour in true Nora Ephron style—with a romantic rendezvous and declarations of love in a stunning New York setting. Walk north on Riverside Drive to 91st St., and take the path west into Riverside Park. Look for the large plaque noting the 91st Street Garden and wait for Brinkley the fluffy golden retriever to bound over to you as “Somewhere Over the Rainbow” plays and you collapse into happy tears. Or, you know, just collapse onto a park bench. Being a romantic comedy fan is exhausting—and appetite-inducing. How about we get something to eat?